Peterhead defender Scott Ross has been banned for two games for spitting on Rangers' Nicky Law during Sunday's League Cup first-round tie. Ross, 24, was issued with a Scottish Football Association notice of complaint and offered a two-game suspension, which he accepted. 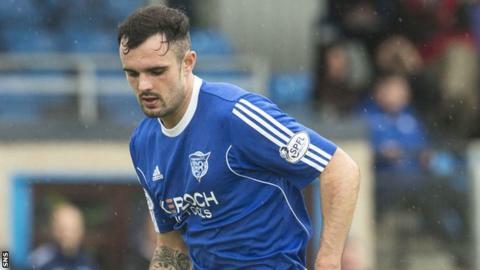 Peterhead issued a statement to confirm they had also disciplined the player. "The PFC board have reviewed the video evidence and spoken with the player," they added. "It is clear that Scott did spit in the general direction of Rangers player Nicky Law and Scott admits that he did spit, but in no way was it intentionally directed towards Nicky Law and [he] is making every effort to speak with Nicky to apologise for the misunderstanding. "Peterhead FC, regardless of the circumstances, cannot condone spitting in any way and, although we accept Scott's explanation, he has fallen below the level of behaviour we expect, and has been fined under the club's disciplinary code of conduct." In a statement, the SFA said: "The two-match suspension will be applied as follows: one match to apply immediately irrespective of competition, and one match to apply immediately to the next match in the specified cup competition."